You’re excited to play tabletop games with your kids, but most are way too complicated for little ones. That’s especially true for fantasy-themed games. Miniature and card-based games tend to have a lot of rules (and a lot of reading) required to play. But not My First Castle Panic. 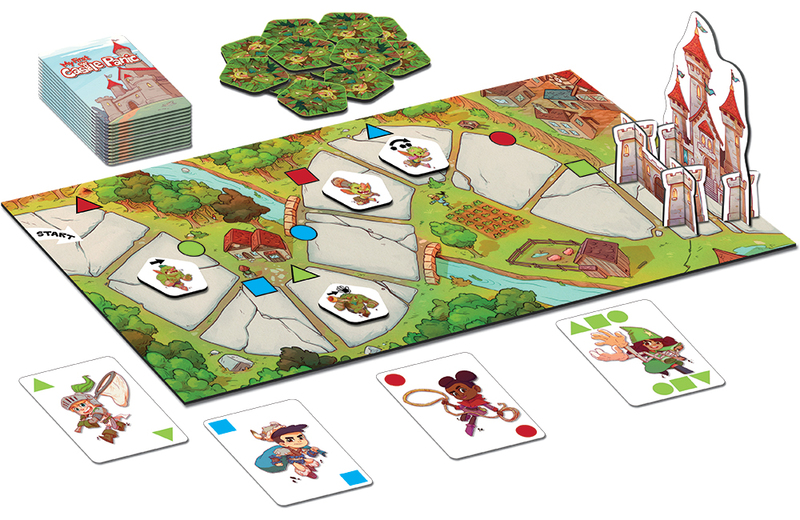 A spin-off of Fireside Games’ Castle Panic, this one is kid-friendly and a whole lot of fun. Goblins are coming to take down your castle. 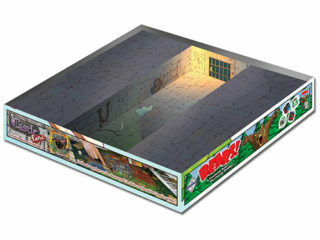 You use heroes (a deck of cards) to stop them and send them to the dungeon. To test out the game, I sat down with my 5-year-old son, Sammy. Overall, the game is pretty simple. There is a path from the forest, where the goblins emerge, to the castle. 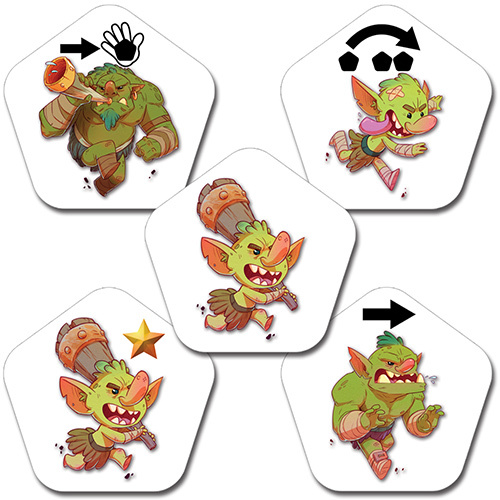 A total of 16 goblins, some with special powers that leap-frog the others or push the entire group closer to their goal, will need to be stopped before they knock your castle flat. 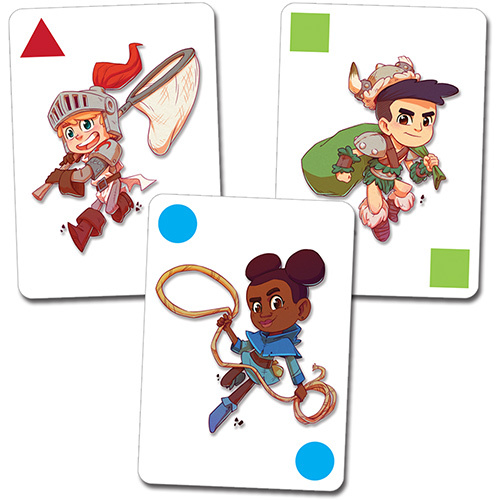 On each player’s turn, four things happen: Draw a card, play a card (or ask for help), move the monsters, draw a new monster. If the goblins get to the castle, they knock it down (first an outer wall, then the whole castle) and you lose. If you stop all 16 of them (sending them back to the game box, which is cleverly designed as a dungeon to house the defeated goblins), you win. It’s easy for a younger kid to grasp, and my 5-year-old had no problems. You play the game with your cards face-up, so kids can see everyone’s hand (and you can give them a little help if needed). It’s also cooperative, so when another player “asks for help” (uses a card from your hand) to stop a goblin, it’s no big deal. After two rounds, my son was telling me what to do. He knew what the cards did. He knew to move the goblins. By the end, he knew the goblins closest to the castle posed the biggest threat. While I wouldn’t call the game educational, per se, it does reinforce a few things for kids. More importantly, the game teaches decision making. Is it better to eliminate a goblin closer to the castle or farther away? Is it more important to take down a monster, or use a card to rebuild the castle wall? And if your kids can’t read yet, that’s no problem. The game itself requires no reading at all to play. Everything is colors and shapes. Once an adult shows them how it works, it’d be pretty easy for most older kids to play the game themselves without too much supervision. Though promo for the game does say, “preschoolers can play independently,” there are a few special rules such as specific monster movement that will likely require some reminders or help for younger ones. Games that take a long time, even Chutes & Ladders, can get a little frustrating for my son. But we wrapped up our first game of My First Castle Panic, including setup, in less than 20 minutes. Later games went much faster. I have to give special props to Cam Kendell, whose adorable fantasy art is all over this game. The monsters are menacing without being scary, and the heroes look simply amazing. My son continually tells me which hero character he’d like to dress up as. He’s very much engaged with the game, and a lot of it is based upon artwork that he clearly loves. My First Castle Panic is now in heavy rotation in my house. My son is begging me to play it all the time. I’m good with that, and I know we’ll be upgrading him to standard Castle Panic when he’s old enough. Purchase a copy of My First Castle Panic on Amazon and help support Crit For Brains.